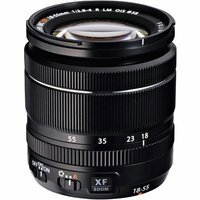 The Fujifilm 18-55mm f2.8-4 R LM OIS XF Fujinon lens adds to Fujifilm's popular X-mount interchangeable series. The lens offers a versatile focal length that's suitable for a variety of shooting scenes, whilst maintaining a lightweight and compact size to complement the Fujifilm X cameras. The lens' bright f2.8-4 aperture range combined with Optical Image Stabilisation (OIS) allows you to capture crisp, blur-free images handheld in dimly lit environments. The linear motor-driven system delivers super-fast autofocus performance of 0.1 seconds to capture those once in a lifetime moments. Silent operation also makes the lens suitable for movie recording. The lens structure consists of 14 elements in 10 groups, including 3 aspheric and 1 extra low dispersion elements, and a seven-blade rounded diaphragm.